Interleukin (IL)−6 inhibition has been approved for the treatment of rheumatoid arthritis, systemic juvenile arthritis, polyarticular juvenile idiopathic arthritis, giant cell arteritis, and, in some countries, Castleman’s disease. IL-6 has also been implicated in several non-rheumatoid arthritis inflammatory and immune conditions such as systemic sclerosis, vasculitides, systemic lupus erythematous, and psoriatic arthritis. In orphan diseases, such as systemic sclerosis, which are associated with significant morbidity and mortality and for which there are no approved treatments, IL-6 inhibition may offer a promising treatment strategy. It is also becoming clear that IL-6 may have an important role not only in inflammatory and immune diseases but also in non-immune mediated diseases such as endogenous depression and depression associated with chronic inflammatory conditions. Several studies have explored the effect of IL-6 pathway inhibition in Crohn’s disease and adult-onset Still’s disease, suggesting that IL-6 may be important in their pathogenesis. A panel of international experts in the field of rheumatology recently came together to consider indications beyond rheumatoid arthritis for IL-6 pathway inhibitors. IL−6 inhibition is effective and approved for the treatment of several inflammatory diseases including rheumatoid arthritis, systemic juvenile arthritis, polyarticular juvenile idiopathic arthritis, and giant cell arteritis. In some countries, it is also approved for the lymphoproliferative disorder Castleman’s disease. However, IL-6 inhibition is ineffective in the treatment of certain other inflammatory diseases such as ankylosing spondylitis. For example, the BUILDER one study, which compared the human anti-IL-6 receptor (IL-6R) monoclonal antibody tocilizumab with placebo in patients with ankylosing spondylitis,1 tocilizumab was ineffective in treating tumour necrosis factor (TNF) inhibitor-naive patients. In the accompanying sections, we will review the evidence that supports the application of IL-6 blocking interventions in the management of specific diseases. The FaSScinate study3 was a small phase II randomised proof of concept study, which randomised 87 patients with systemic sclerosis to either placebo or subcutaneous tocilizumab treatment. Many of the patients had chronic established systemic sclerosis. The primary endpoint was the difference in mean change from baseline in modified Rodnan skin score at week 24. The least squares mean change in modified Rodnan score at 24 weeks was –3.92 in the tocilizumab group and –1.22 in the placebo group (difference –2.70, 95% CI –5.85 to 0.45; P=0.0915). 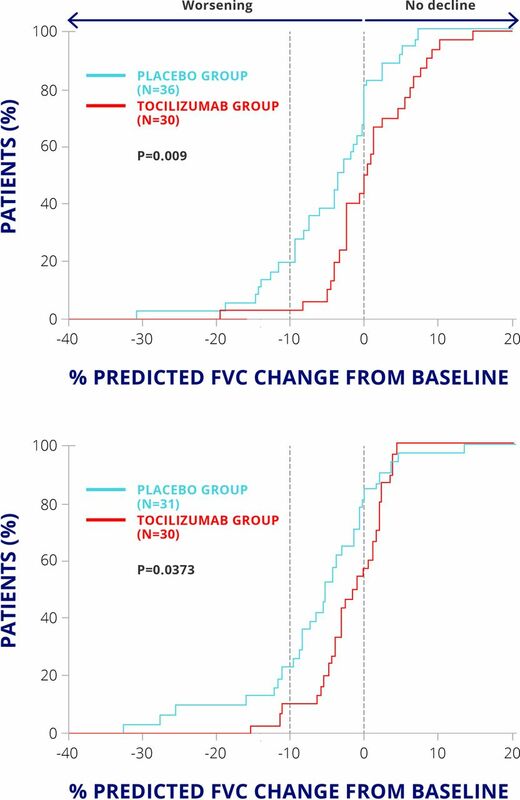 At the end of the study, week 48, there was numerical difference with less progression in skin thickening observed in the tocilizumab group (–6.33) compared with the placebo-treated group (–2.77) (figure 1). The difference just failed to reach statistical significance (treatment difference –3.55,–7.23 to 0.12; P=0.0579), which may be a result of the small number of patients in each group. Importantly, patients who were treated with tocilizumab had less reduction in forced vital capacity at 48 weeks than the placebo-treated group (P=0.0373) (figure 2). Therefore, IL-6 inhibition may be a promising strategy for this orphan disease for which there is currently no effective treatment. Other conditions in which IL-6 has been implicated include the vasculitides. The association between cytokines and different vasculitides are listed in table 1.4–7 Elevated IL-6 activity is often associated with active disease in many vasculitides (table 1). A phase II randomised, placebo-controlled trial of tocilizumab in giant cell arteritis recruited patients with giant cell arteritis who were aged 50 and over and had new onset or relapsing disease.9 Thirty patients were randomised 2:1 to receive either tocilizumab (8 mg/kg) or placebo intravenously. Thirteen infusions were given at 4-week intervals until week 52. Both groups received oral prednisolone, starting at 1 mg/kg per day and tapered down to zero according to a standard reduction scheme defined in the study protocol. The primary outcome was the proportion of patients who achieved complete disease remission at a prednisolone dose of 0.1 mg/kg/day at week 12. 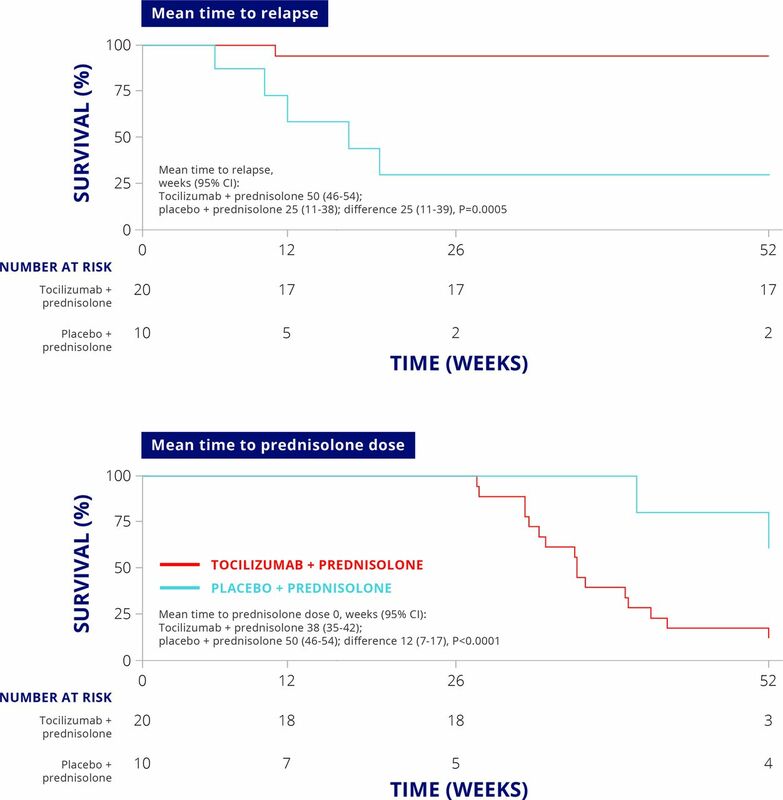 The mean time to relapse and the mean time to prednisolone dose were longer in the tocilizumab group than in the placebo treated group (figure 3). These differences were statistically significant, showing that tocilizumab allows for more rapid withdrawal or tapering of steroid treatment. Clinical efficacy of tocilizumab in giant cell arteritis. There is also evidence for involvement of IL-6 in polymyalgia rheumatica, with patients having increased serum IL-6 concentrations compared with normal controls, and changes in serum IL-6 concentrations correlating with clinical manifestations during prolonged corticosteroid therapy.12 Because polymyalgia rheumatica and giant cell arteritis are clinically related syndromes, by extrapolation there is a strong interest in the potential of using tocilizumab therapy in patients who have long-standing polymyalgia rheumatica requiring high doses of steroids. In a small open-label study, 16 patients with mild to moderate SLE were treated bi-weekly for 12 weeks with one of three doses of tocilizumab: 2, 4, or 8 mg/kg.18 Patients were followed for an additional 8 weeks. Tocilizumab reduced disease activity in patients with SLE, and significant improvements in SLEDAI and Systemic Lupus Activity Measure (SLAM) scores were observed after 14 weeks. Arthritis improved in all seven patients with symptoms at baseline, and four patients saw their symptoms resolved. Illei et al also showed that tocilizumab therapy reduces autoantibody production in SLE: the frequency of plasma cells decreased significantly over 14 weeks; levels of anti-dsDNA autoantibodies decreased by a median of 47% in patients treated with 4 mg/kg and 8 mg/kg doses of tocilizumab. In a recent dose-ranging randomised controlled trial, Wallace et al evaluated PF-04236921, a fully human immunoglobulin G2 monoclonal antibody that binds and neutralises IL-6, in patients with active SLE at doses of 10 mg, 50 mg, or 200 mg over a 24-week double-blind treatment phase.19 While there was no significant difference from placebo among the treatment arms for the primary endpoint (proportion of patients achieving the SLE Responder Index (SRI-4) at week 24, there was improvement measured in the primary and key secondary end points with the 10 mg dose. Additionally, in a post-hoc analysis, the subgroup of patients with high disease activity at baseline showed higher response rates with the 10 mg dose. To date, there has been no large placebo-controlled trial in this condition. In a 24-week randomised, double-blind, placebo-controlled, dose-ranging study, patients with active psoriatic arthritis were randomised 1:1:1:1 to receive subcutaneous placebo or subcutaneous clazakizumab, an anti-IL-6 monoclonal antibody, at dosages of 25, 100, or 200 mg every 4 weeks with or without methotrexate.24 The primary endpoint was response rate according to ACR20 at week 16. This study showed that clazakizumab therapy was able to significantly improve arthritis score, with approaching 50% of patients achieving ACR20 response in the clazakizumab-treated group compared with 29% receiving placebo treatment (figure 4). 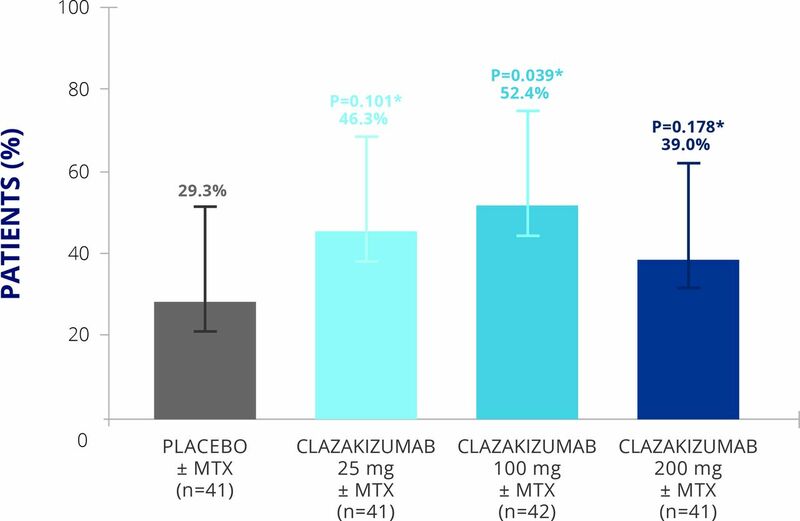 Clinical efficacy of clazakizumab in psoriatic arthritis.24 MTX, methotrexate. However, only small improvements in skin disease were reported (table 2). This study shows that clazakizumab could be useful in improving physical function in patients with psoriatic arthritis who have well-controlled skin disease. 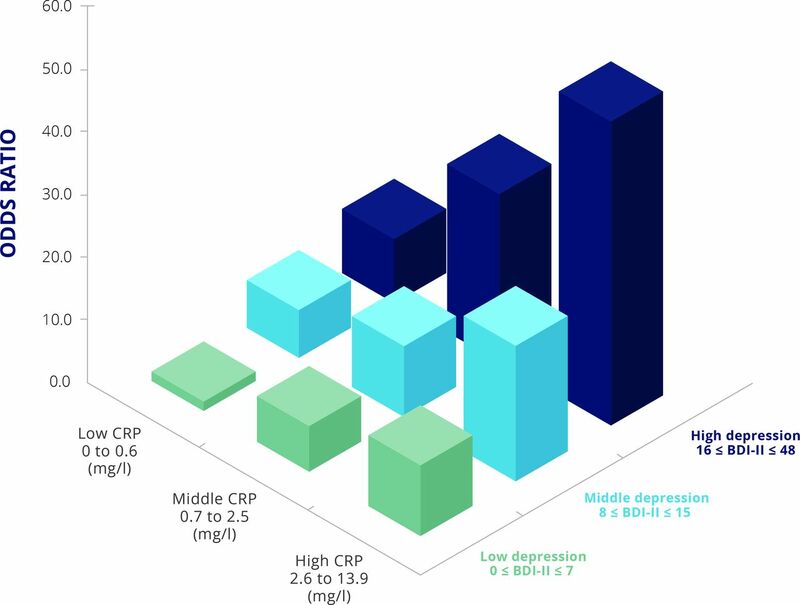 Increased CRP concentration is associated with depression in rheumatoid arthritis.30 BDI-II, Beck Depression Inventory II score; CRP, C-reactive protein. The findings above have led to interest in IL-6 inhibition as a possible treatment for depression and associated disorders.37 Improvement in mental health and mental component scores in anti-IL-6 therapy (sirukumab) have been observed in the SIRROUND-T trial, a randomised, double-blind, placebo-controlled, phase III study, which examined efficacy and safety of sirukumab in patients with active rheumatoid arthritis refractory to anti-TNF therapy.38 Sirukumab 50 mg every 4 weeks or 100 mg every 2 weeks showed improvement in mental health component score compared with a placebo-treated group. Therefore, in patients with rheumatoid arthritis who have associated depression, it seems that IL-6 inhibition may be able to improve the mental health. The question remains as to whether this may be unique to IL-6 blockade, and whether it is a specific effect of IL-6 cytokine blockade as opposed to the receptor blockade, as this was not seen in the RADIATE study of tocilizumab in patients with rheumatoid arthritis and inadequate responses to TNF inhibitors.39 A randomised, controlled trial is under way to examine the effect and safety of sirukumab in major depressive disorder. However, following a negative review from the FDA, sirukimab development and registration has been stopped. There is a need to train physicians to be more comfortable in talking to patients about mood. We recognise that one of the real challenges for people with mental health problems in most developed societies is the stigma associated with acknowledging that symptoms exist. Yet, in addition to a reaction to a set of circumstances, there is real biology underlying depression. IL-6 pathway inhibition may provide hope as a treatment strategy, not only for rheumatic diseases with no currently approved treatment options, but also for other conditions such as giant cell arteritis, with potential as a glucocorticoid sparing approach to treatment. Targeting IL-6 may also represent a possible future treatment or disease modification approach for patients with depression with or without a chronic inflammatory condition.
. Evidence for RANTES, monocyte chemotactic protein-1, and macrophage inflammatory protein-1 beta expression in Kawasaki disease. J Rheumatol 1997;24:1179–85.
. Cytokine profile in Behçet’s disease patients. Relationship with disease activity. Scand J Rheumatol 2002;31:205–10.
. Cytokine production, serum levels and disease activity in systemic lupus erythematosus. Clin Exp Rheumatol 2000;18:565–70.
. Elevated levels of endogenous IL-6 in systemic lupus erythematosus. A putative role in pathogenesis. J Immunol 1991;147:117–23.
. Interleukin-6 and soluble interleukin-2-receptor in psoriatic arthritis: correlations with clinical and laboratory parameters. Clin Exp Rheumatol 1996;14:413–6.
. Interleukin-6 and soluble interleukin-2 receptor alpha-markers of inflammation in patients with psoriatic arthritis? Clin Exp Rheumatol 2009;27:120–3.
. Highly increased levels of tumor necrosis factor-alpha and other proinflammatory cytokines in psoriatic arthritis synovial fluid. J Rheumatol 1997;24:518–23. Funding This initiative is sponsored by R-Pharm through the provision of an unrestricted educational grant. R-Pharm has had no influence over the content. Competing interests DA declares no conflicts. EHC reports grants from NovImmune AG, grants and personal fees from Pfizer, grants from UCB, grants and personal fees from Roche, personal fees from Abbvie, Biogen, Bristol Myer Scripps, Chugai Pharma, Eli Lilly, Hospira, Janssen, Novartis, Regeneron, R-Pharm and Sanofi-Aventis; SAJ reports non-financial support from CESAS Medical during the conduct of the study; personal fees from CESAS Medical, Eleven Biotherapeutics, grants and personal fees from Roche Pharmaceuticals, personal fees and other from Genentech, grants and personal fees from Glaxo-Smith-Kline, Chugai Pharmaceuticals, Ferrin Pharmaceuticals, Regeneron/Sanofi, grants, personal fees and non-financial support from NovImmune AG, outside the submitted work; IM reports grants from Roche and Refereron, during the conduct of the study; grants and personal fees from Abbvie, Astra Zeneca, Celgene, GSK, Janssen, Lilly, Novartis, Pfizer, Roche, grants and personal fees from Refereron, outside the submitted work; JS reports grants from Abbvie, Astra-Zeneca, Janssen, Lilly, MSD, Pfizer, Roche, personal fees from Abbvie, Amgen, Astra-Zeneca, Astro, BMS, Celgene, Celltrion, Chugai, Gilead, Glaxo, ILTOO, Janssen, Lilly, Medimmune, MSD, Novartis-Sandoz, Pfizer, Roche, Samsung, Sanofi, UCB during the conduct of the study; TT reports grants, personal fees and other from Astellas Pharma Inc, Abbvie GK, Mitsubishi Tanabe Pharma Co, grants and personal fees from Bristol–Myers KK, Chugai Pharmaceutical Co Ltd, Daiichi Sankyo Co, Ltd, Pfizer Japan Inc, grants from Takeda Pharmaceutical Co, Ltd, Teijin Pharma Ltd, Asahikasei Pharma Corp, Eisai Co Ltd, AYUMI Pharmaceutical Corporation, grants and other from Taisho Toyama Pharmaceutical Co Ltd, Nipponkayaku Co Ltd, other from Astra Zeneca KK., Eli Lilly Japan KK, Novartis Pharma KK, Janssen Pharmaceutical KK, outside the submitted work; The participants/authors received personal fees for their participation in the round table. Copyright © 2017 BMJ Publishing Group Ltd & CESAS Publications Ltd. All rights reserved.